Naperville, Ill.’s station No. 10. 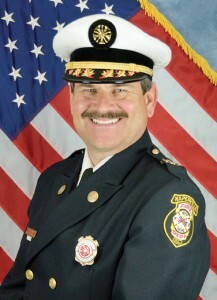 November of 2008 wasn’t the easiest time to be appointed fire chief for the city of Naperville, Ill., Mark Puknaitis said. With the country immersed in the mire of an economic recession, he knew that every city and town would have to take proactive measures in order to ride the storm out. “We certainly weren’t immune to the turmoil,” he said. Located 28 miles west of Chicago, Naperville is a vibrant, thriving city that consistently ranks as a top community in which to live, raise children and retire. Its infrastructure has been studied by booming bedroom communities throughout the nation, and once again — thanks to Puknaitis and the city council’s outside-the-box thinking — Naperville is leading the way. Now it’s showing other municipalities how its fire department has managed to preserve jobs and maintain a quality level of service while saving money at the same time. 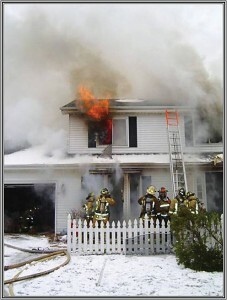 Firefighters in Naperville, Ill., put their training into practice during a house fire in early 2012. The city has been very appreciative of the department’s commitment to savings, and the residents of the community can feel good knowing that there are 18 front-line emergency vehicles staffed with highly cross-trained members who are capable of responding and mobilizing to the emergency they are called to. In addition, Puknaitis said the department recently received a $1 million grant that will enable it to connect the stations for the purpose of video conferencing and training. This will keep personnel at the station, in order to respond to calls, while still providing the training they need to stay current in their profession. Keeping them on station for training has resulted in fuel savings for the department as well. Puknaitis stressed that the cost-cutting measures the department put into place have not been a Band-Aid approach, but rather a way to look at the future. He still constantly gauges new opportunities that will help the department move forward responsibly. 0 – The number of firefighters hired by Naperville, Ill., to staff a new fire station in 2010. To cut costs while preserving personnel, staff was transferred from others stations to the new one. $1 million – Naperville recently used a $1 million grant to install a system for video conferencing at its stations. The system is used for training, which firefighters complete on station — thereby reducing both fuel costs and the expense of duplicate staff that’s incurred when some staff members have to leave the station to attend training.